Arizona was experiencing some of the worst winter rain storms in decades. Flooding and heavy winds were forecast for the whole auction week but there was some relief from the weather here and there. Careful planning of your outdoor car viewing in coordination with the breaks in the storms determined where you needed to be and at what time of the day. Thursday, however, began with rain and wind and only got worse as the day went on. What better day to be inside The Garage at the Barrett-Jackson auction site attending a seminar on our favorite cars? The overall theme of this year's seminar was the value of the original unrestored car as an investment and as a preservation of Corvette history. There was a time when a nice original car was considered an excellent restoration candidate because there was so little heavy repair and practically no parts hunting to do. Frames had their welds smoothed and were painted high gloss black. Bodywork and exterior paint was finished to a level never seen on these cars when they were new. Extra chrome was added as well as factory accessories and options not installed on the car when first assembled. Then collectors and restorers began to see the light. They began to realize that a car is only original once. Quality original cars should be preserved as a learning tool so that future hobbyist and restorers can see how they were when they were new. As the seminar began we were given a warm welcome by Steve Davis and Gary Bennett of Barrett-Jackson. Then the panel was introduced. David is the CEO of Bloomington Gold which dates back to 1973. 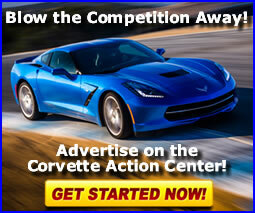 It is the longest continually running Corvette show and the standard by which all others are judged. Jim is the President of County Corvette in West Chester, Pennsylvania. He co-founded the business in 1986 and has grown it into the East Coast's largest Corvette-only sales and restoration facility. Kevin of Valley Stream, New York has owned Corvette Repair, Inc. since 1987. 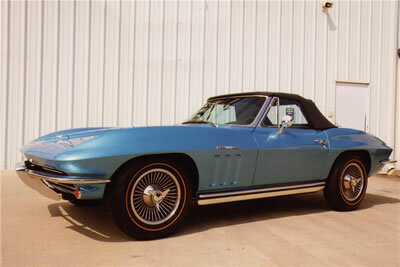 It is widely recognized as one of the premier Corvette restoration facilities in the world. Kevin has been a Master NCRS and Benchmark Bloomington Gold Judge for over 20 years. Terry is owner of Pro Team Corvette and is regarded as one of the world's leading authorities on classic Corvettes. He has bought and sold more that 10,000 Corvettes in his 37 year career. Michael has had a passion for Corvettes since his neighbor bought a '53. He has been involved with the NCRS since 1980 and ranks around number 30 out of 4000 NCRS judges. Roy, the NCRS National Judging Chairman from 1996 to present, served as a Bloomington Gold judge for 10 years. He was the NCRS 1967 Team Leader from 1990 to 1996 and formed Sinor Prestige Automobiles, Inc. in 1982. Mike is the Chief at Mid America Motorworks in Effingham, Illinois, the world's largest retailer of aftermarket Corvette parts and accessories. He founded the company in 1974 when he borrowed $500.00 and began selling Corvette service manuals out of the trunk of his car. Under the Performance Choice label, the manufacturing arm of Mid America , Mike produces high quality automotive interior products. David Burroughs began the seminar by giving background on the purpose of Bloomington Gold. It was recognized that there was a need for judging Corvettes against a standard instead of the usual car show way of awarding 1st place, 2nd place and so on. The purpose was to shift paradigms from cosmetic perfection to historic perfection with a mission to inspire preservation, conservation, or at least accurate restoration. The judging would be held once a year with records kept in a national record center. A car could be improved and brought back to be judged again another year. Three levels, Gold, Silver and Bronze were awarded depending on final score. The Survivor award was established later to recognize Corvettes that were in good condition and still remained 50% unrestored with 50% unrestored finishes that appeared nearly new. Later the Benchmark award came along to honor the few cars that could pass Survivor judging on Saturday then score a Gold award on Sunday. This award brought out some truly amazing Corvettes so there was a new award created, the ZZenith Award, to honor the best of the best. These were Corvettes that were 40 years old, 90% unrestored with 90% unrestored finishes that remain nearly new in appearance. Survivor cars cannot be improved and brought back for Survivor judging again. Roy Sinor followed next with a discussion of the NCRS Chevrolet Star/Bowtie Award. The purpose of the award is to recognize unrestored 1982 or older Corvettes which are judged to be historically and educationally significant in any one or more of four areas: interior, exterior, mechanical, and chassis. A car can only receive the award at the National Convention after being presented at a NCRS Regional event for evaluation and sign off. A car can only be judged once and cannot improve. Depending on the judging standards met a car can earn a 1 Star Award up to a 5 Star award. There are both quantitative and qualitative judging standards. Quantitative asks "Does the item, part, fabric, plating or coating appear to be that which was actually installed or applied on this car at the time of manufacture?" Qualitative asks "Does the area judged display significant educational and historic value which should be preserved in its present condition?" It is a pass or fail scoring system. The discussion then turned to the advantages of original preserved cars. We are seeing an increasing popularity in original unrestored cars with some selling for unheard of prices because of their originality. It was said that when a car is original it can write a book. Survivor quality cars are getting rarer every day. A close inspection of a truly original car reveals so much that will never be seen on a restorered car. It will speak for itself making extensive documentation less important. One panel member chimed in that restoring a car robs it of its soul. Many an original Corvette has been lost to the restoration process. Once restored it is just another car. Original cars have a cool factor that can't be restored once removed. Everyone agreed that the truly original cars, at the end of the day, 20-30 years from now, will be the most valuable cars to own. Even more so if it is well documented with a sound judging history. So as an investment what do we buy, sell or hold onto? Here are some opinions from the panel.